﻿ Royal River kwai Resort & Spa, Kanchanaburi | FROM $46 - SAVE ON AGODA! "Amazing pool, phenomenal location, better than expected food..."
Have a question for Royal River kwai Resort & Spa? "Restaurant was awesome for all meals." "Beautiful garden and big swimming pool." 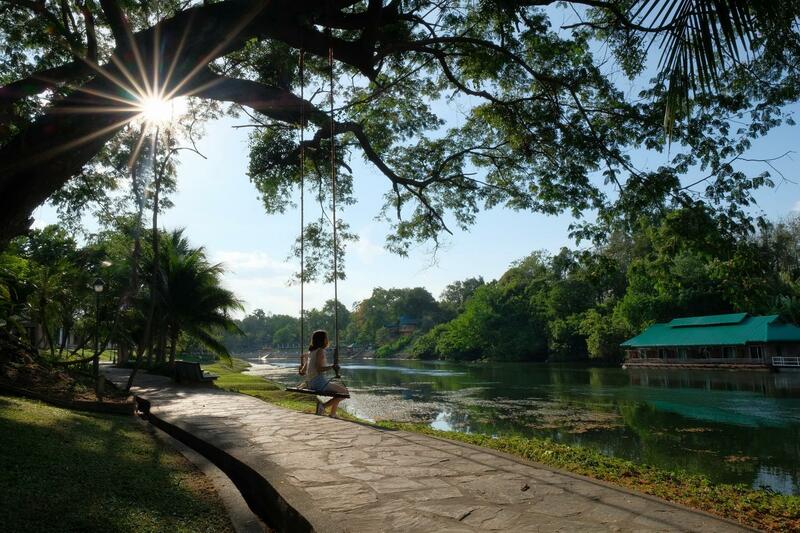 "The Agoda price made staying at this lovely resort affordabl..."
This tranquil resort offers a sanctuary on the banks of the River Kwai, a short driving distance from Kanchanaburi. With the town just eight kilometers away, rental motorbikes can make trips to the River Kwai Bridge and War Memorial extremely convenient and inexpensive. Other popular attractions here include the Erawan Falls and the Tiger Temple. All guestrooms and suites feature a private balcony and floor-to-ceiling glass windows for optimum views of the river, tropical gardens, and the swimming pool. After a day touring the city, you are sure to enjoy a trip to the spa which offers herbal steams and aromatherapy massages. Royal River kwai Resort & Spa is tucked away in a quiet and secluded corner on the Kwai riverbank, making it an ideal accommodation for romantic getaways and peaceful family vacations. Children 5-11 years old will be charged THB 160 for breakfast when using existing bed. 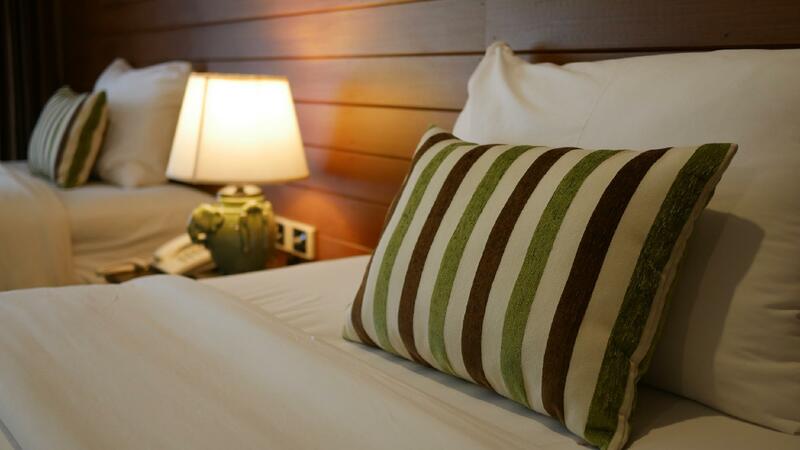 Children 12-17 years old will be charged THB 320 for breakfast when using existing bed. Had a great stay at the hotel, great pool and view of the river.As a paddle boarder it was amazing to go boarding with SUP hire Thailand who are based near the hotel, The Hotel is near the town so very easy to see the bridge and other places of interest. 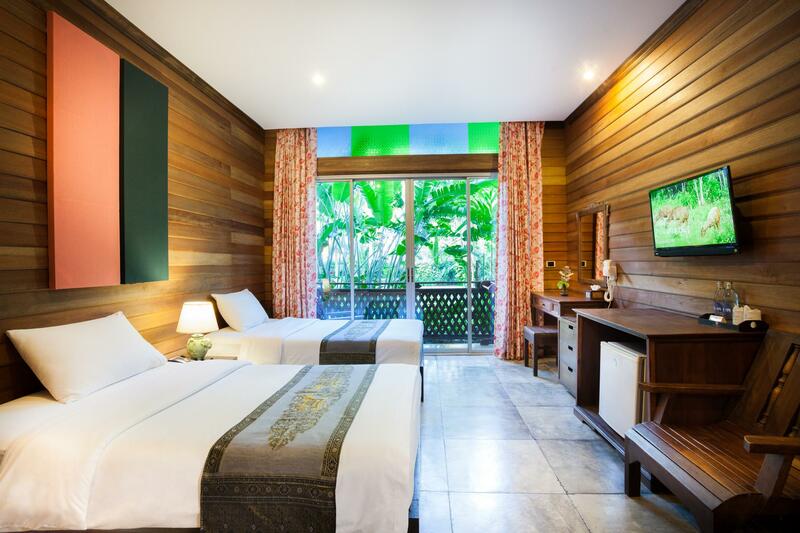 The hotel is very *Green*, well design, very Balinese but you won't get this price in Bali resort. It's so worth of money. Good breakfast. It has what you need to start up your day. Nice swimming pool that you can chill during your stay. Of cause, the river side provides you some sitting area to enjoy the scenery. The only problem is you may need a car to travel out. Overall it is a good choice and glad that I made the correct decision. Awesome, peaceful, just perfect! It’s the perfect hidden jewel. Not too big, not too small, just perfect. Not too luxurious, not too budgetty, just perfect. Awesome location on the river bank, perfect pool, just perfect… ROOMS: Nice size, cozy decoration, not too fancy. CLEANESS: Perfectly clean HOTEL AREAS: The most perfect of all. Space for yoga, meditation on the little huts that are all over. Peacefull terraces on the river bank, Nice swing by the river. Perfect pool. All the hotel areas are just awesome. Live music during dinner time. STAFF: Attentive BREAKFAST: Really good, buffet style. Food in general was awesome! VALUE FOR MONEY: EXCELLENT! Stunning setting with an amazing pool. Very friendly and helpful staff. Some members of the reception staff were a little sharp but we think It is due to language barrier. Rooms were lovely however tea and coffee facilities would have been a bonus. Overall fantastic stay, breakfast caters for everyone with plenty of choice and the riverside restaurant is worth a visit. Real value for money. I enjoyed staying at the resort for new year trip. The resort itself was private, clean and comfortable. I loved the live music at dinner time. Although the food for dinner is quite mild taste, it may good for foreign-friendly taste. Very wide area beside the River. Enjoy the good swimming pool. No lift to go to 2nd floor. Swimming pool only lmit to 7PM. No light surround swimming pool. For the dinner, food and environment is excellent. Cons - hard to get transport to and from hotel to town. No took tools. So at the mercy of minivans and taxi drivers. WiFi was reasonable, food and drinks average price. No tea/coffee facilities in the room which is disappointing. Mosquitoes obviously an issue near a river PROS Beautiful surrounds and large pool with small pool for young children. Cost available for kids. Staff very helpful. Great breakfast. Nice riverside area to sit and eat or have a drink. Highlight of our whole trip. no complaints or suggestions. restaurant was awesome for all meals. Dinner along the river was a treat. one of our favorite hotels and locations of all time. front desk can arrange any outing or event. This place was wonderful.. Beautiful garden and big swimming pool. Location was excellent. We can have dinner by the river kwai. This is my second time staying here. Staff were good and friendly as always. Room is okay with traditional decoration of woods. Breakfast was good, variety of choice and I ate a lot! Value for your money, value for your stay. Will be my first priority when visit Kanchanaburi. Love. Wonderful experience but far from town. But we knew that and we were happy about it. Maybe troulesome without your own private car but there are two shuttles downtown twice a day offered by the hotel. Good place to stay for a weekend or so, amenities were great for a family with a kid and resort is well maintained and beautiful . Breakfast and food in general was good. A bit pricey but it goes with the resorts i guess. The hotel is closed to the city of Kanchanaburi and it is convenient to find tourist attractions and places to eat. The hotel and the room are clean and spacious. The staff is nice and smile all the times. The swimming pool is perfect and you should not miss it. We have wide variety of breakfast buffet. The only disadvantage is that the loud nice at night from the opposite site of the river at night until 11pm. This resort is getting older but has a natural wood charm in the rooms which helps compensate for its aging. But it is located on a sprawling and very well manicured estate with private access to to a large section of the river. It is quiet and peaceful and well staffed. It does require transportation to get to downtown however. The swimming pool is gigantic and well tended and beautiful. Breakfast is fine. The Agoda price made staying at this lovely resort affordable for me. The resort is located 5 minutes out of town and right on the river. Beautiful well maintained gardens (huge staff numbers), and the best swimming pool at any resort I've stayed at in Thailand over the past 12 years of holidaying at least once each year. The restaurant is reasonably priced and weather permitting is out doors right on the river bank , service is exceptional. I will definitely be returning. A lovely resort on the banks of the River Kwai (Mae Man Kwae). Lovely gardens, great swimming pool, nice restaurant with evening (gentle) live music, reasonable amount of English spoken. Rooms were fine. Sufficient parking with guard on gate. A quiet retreat that is a paradise if you are looking for an escape from the chaos of Bangkok. My family came to visit us in Thailand and we brought them here. It is a wonderful place to stay. We were here for 2 nights. The breakfast is nice and there are many choices. This is a nice place to stay and do day trips or just stay and relax at the resort. I would HIGHLY recommend it! This is a wonderful hotel on the River Kwai. The gardens were immaculate, the room clean and comfortable, and the dinner generous and delicious. The spa was a wonderful treat before dinner. This is an excellent hotel for exploring Kanchanaburi, or just a quite retreat from the city. It is outside the city center, so a car is recommended.